This savory one-pot chicken dish is about to become your new weeknight go-to. With just a few ingredients, easy clean-up and a cooking time of less than half an hour, it's perfect for those nights when you barely have time to cook, let alone shop for groceries. Braised chicken thighs and a mixture of delicious wild mushrooms come together in a simple butter sauce, lightened with a splash of sherry vinegar. It also makes a lovely main course for entertaining, and you can serve it right in your cast iron skillet for a rustic presentation. Finish with fresh chopped parsley! If you have a big enough skillet, double the mushrooms for a heartier portion size. Serve with good crusty bread to sop up the sauce.If you prefer, you can also use bone-in, skin on chicken breasts for a lower-fat alternative. Be sure to check their internal temperature, as they may require longer cooking. Per Serving: 155 calories; 11g fat; 4.2g carbohydrates; 10g protein; 55mg cholesterol; 218mg sodium. My husband and I tried this recipe and it was so simple and delicious! The mushrooms and sauce are perfect, it smells and tastes amazing, so much flavor. He even asked me to make more the very next day! 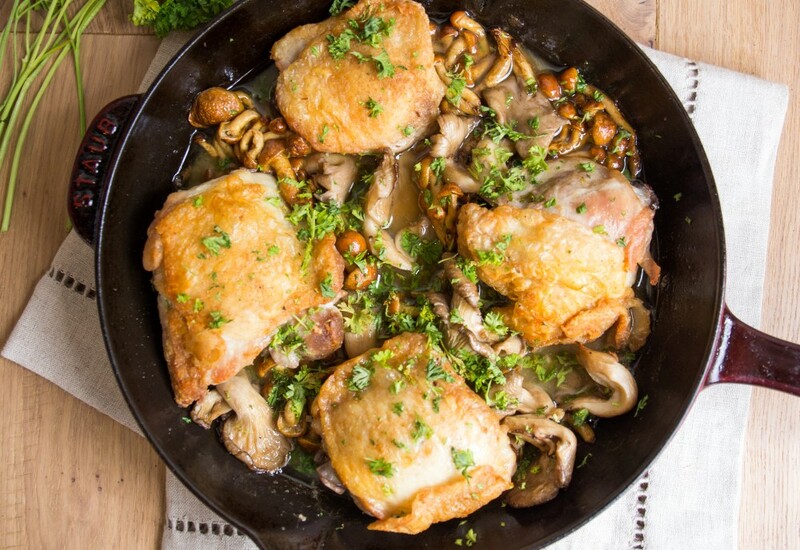 Obsessed with this chicken and mushrooms dish! Perfect for busy weeknights when I want something filling and nutritious. I smother rice in the chicken and mushroom sauce, so good! It was delicious. Reminded me of a meal my mom used to make. I made it with chicken breast instead of thighs and paired it with spaghetti sauce and pasta. But you have to make them separately and only combine them on your plate! That way you get the two strong flavors as individuals. I've just been getting into chicken and mushroom lately, but want to steer cleer or button mushrooms (it's a texture thing). This medley with the chicken seemed like a good fit, and the slight butter sauce is a really simple and nice touch. A couple of things stand out for me: make sure to get a great sear on the chicken thighs - that golden crispiness on the skin really can't be beat. The splash of sherry vinegar also adds that nice acidic touch. I will definitely make this again - solid, quick dinner in less than an hour. I love making one-pan dishes (because I don't like to clean a lot of dishes!) so I tried this one out. The chicken thighs stayed really juicy and the sherry makes the mushrooms pop. I served this over brown rice, really great weeknight dish.